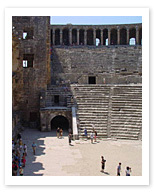 The Roman theatre standing in Aspendos is its most famous and most impressive monument. It is among the very best ancient theatres in the world. In fact, it is so well-preserved, that it is still used today, seating over 20,000. Don’t miss an opportunity to see a show here! Filled with throngs of people and echoing with sound, the theatre in use is a truly magical place, capable of bringing the excitement of the past alive as few others places can. And thank Ataturk, founder of the Turkish Republic, who upon seeing it, demanded that the theatre be used rather than converted into the museum, for the experience.